So…table setting is a thing. And in those circles where it’s a serious thing, it’s termed “tablescaping.” At The Mad Table, we’re mad for tablescaping! In recent years, tablescaping has been elevated to an art form. We’re here to give you the latest tips and tricks to make your next table and/or event look like you’ve hired a team of artists to put on the finishing touches. And you don’t need to wait for a holiday to prepare the table decorations. With a little planning, you can make almost every meal a special occasion. At The Mad Table, we have a weak spot for all things beautiful and an ongoing love affair with charming tableware. The goal is to find a magical interplay amongst the decorations and pieces on your table. That said, we usually follow the “less is more” rule. 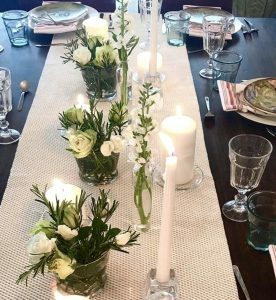 We dress our table when we’ll be entertaining guests, hosting a cooking class or even simply having a friend over for lunch. In other words, ALWAYS! We set a beautiful table because we know it makes our guests feel special, inspires them and makes them want to connect and share. 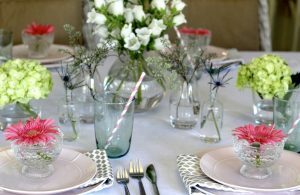 Where to shop for table setting pieces? West Elm, Home Goods, TJ Maxx, Goodwill, antique shops, consignment stores. Anywhere and everywhere! You’ll be surprised by the treats you find when you’re out and about and open your mind to the possibilities. What can be used for decoration? Fresh flowers or greenery is almost always a must! Here are some of our favorites:eucalyptus, lavender, succulents, gerbera daisies, tulips, peonies, fresh herbs and olive branches. Simple candles – votives or tapers. Mini bud vases filled with your favorite flowers or greenery. If you’re on a budget (and we certainly understand that! 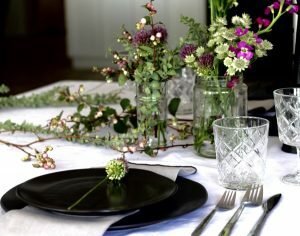 ), clippings from wild vines, dried twigs or an assortment of leaves from the backyard can be lovely. Handwritten name cards are always a nice touch. For kids’ parties, think candy jars, beautifully decorated cookies, mini bowls with snacks. Various glass water pitchers with slices of cucumber, apple or citrus or add berries, mint or watermelon. We also love personal touches, like individual wine carafes, simple flower stems or fresh herbs placed on napkins and tied with jute, twine or ribbon, homemade gifts for guests (spice blends, salts or a sweet treat). At The Mad Table, we always prefer glass plates or nice china and real napkins. But don’t stress about ironing those napkins. You can twist them into a knot and no one will notice that they’re wrinkled or just dampen linens and toss them in the dryer for a quick fix. For more tips on making every day a celebration and for decorating with style and flair, find us at The Mad Table website. And be sure to like The Mad Table on Facebook and follow us on Instagram for all the latest news, fabulous recipes and gorgeous entertaining tips and ideas.